Originally published under the title "Turkey's Flotilla: What Was It Really About?" Tens of thousands of Turkish Islamists rallied on May 31, 2015, to commemorate the fifth anniversary of the Mavi Marmara flotilla incident. Five years ago this week, on May 31, 2010, a Turkish flotilla with hundreds of pro-Palestinian activists aboard sailed toward the Gaza Strip in order to break Israel's naval blockade. Israel had established the blockade to prevent weapons from being shipped to the Hamas terrorist organization, which rules Gaza and is openly committed to Israel's destruction. Before reaching the Gazan shore, however, the Turkish ship, Mavi Marmara, was boarded by Israeli commandos, and 10 activists were killed in what would become the worst ever diplomatic crisis between Turkey and Israel. Later, a UN-sponsored probe into the Mavi Marmara incident would accuse Israeli soldiers of excessive use of force, but declare Israel's blockade as legal. With the Mavi Marmara, the Turkish government wanted to provoke Israel and cause an incident. Then the whole world learned who benefitted. By discreetly encouraging the flotilla, Erdogan aimed to boost his popularity on the Arab Street and win votes at home. By discreetly encouraging the flotilla, and possibly calculating its aftermath, the Turkish government aimed at two things: boosting then Prime Minister [now president] Recep Tayyip Erdogan's popularity on the Arab Street and consolidating his votes among Turkey's conservative masses. The first aim has dramatically failed, except in the Palestinian territories and Qatar; but the second has been achieved. The Palestinians and Islamist Turks commemorated their "martyrs" on the fifth anniversary of the Mavi Marmara affair without realizing how much they fancy the "show" side of political Islam while dutifully ignoring facts. "We salute you, Turkish people," banners read in Gaza City, where Palestinians placed a wreath on a memorial built for the victims. "We have gathered here today to honor those who had made the biggest sacrifice and died for Palestine," said Jamal al-Hudari, president of the Popular Committee Against the Siege. "We send our greetings to the relatives of the martyrs and President Recep Tayyip Erdogan." Bassem Naeem, a Hamas official, described the Mavi Marmara incident as "seminal" in the history of the Palestinians and demanded that Israel be brought to trial for killing the activists. 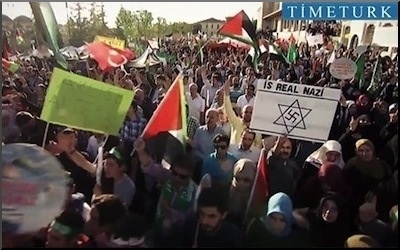 As always, in Turkey, the show was more pro-Palestinian than any show in the Palestinian territories. A group set off from the central Anatolian city of Konya and stopped in Ankara to perform morning prayers in front of the Israeli ambassadorial residence, in commemoration of the incident. Then they went to Istanbul to join a bigger event. In Istanbul, tens of thousands gathered in front of the Fatih mosque for the Mavi Marmara commemoration. They carried Palestinian flags and banners with Arabic script. A choreographed show featured the words "Freedom for Quds (Jerusalem)." Still wondering what relevance Jerusalem could have to an incident off the Gazan coast? A prominent Islamist columnist, Abdurrahman Dilipak, explained it in a speech: "The liberation of Quds (Jerusalem) is the liberation of Mecca and Medina. The liberation of Mecca and Medina is the liberation of our mosques." Typically, Dilipak argued that the deaths of 10 activists aboard the Mavi Marmara were "a merry event" as they had become "martyrs." And Bulent Yildirim, head of the Humanitarian Aid Foundation (IHH), the organizers for the Mavi Marmara flotilla, claimed in a speech that "we could kill at least 100 Israeli soldiers if we wanted to." Judging from the scenes in Gaza and Turkey, one might think that the Turks are the eternal saviors of their Palestinian brothers, or that Turkey is the biggest benefactor of the Palestinian territories. One day, perhaps, the Palestinians will understand that their "cause" is, for their Turkish brothers, merely an ideological feel-good motive and an instrument in the quest of many Turks to consolidate power both at home and in the Arab world. Turkey has delivered only 0.26% of the aid to Gaza it pledged at a donors' conference last year. Ironically, about a week before the Mavi Marmara commemoration, hysteria gripped Turkey: a World Bank report revealed that the Turkish government had failed to deliver a large portion of the aid it had pledged for the reconstruction of Gaza during an international donors' conference last year. The report said that Turkey has so far delivered only 0.26% of the aid it had pledged at the donors' conference in Cairo last October. Turkey, which pledged $200 million, has provided only $520,000 the report said. Turkey's unofficial aid for Gaza did not reflect the Palestinian-fetish visible across the country, either. All that 77 million Turks could collect to donate to Gaza stood at $32 million, or about 40 cents per person. In other words, the Turkish generosity for "our Palestinian brothers" was a mere 0.004% of the country's national income. "This is a clear picture showing the AK Party's true colors. They turn Gaza into a political pawn and exploit it, then fail to honor the pledge ... It's tragic. How could you not honor your promise to Gaza?" asked Mehmet Gunal, an opposition member of parliament. Turks love to play the generous benefactor of the Palestinians and the custodians of the Palestinian cause. Underneath, its "pro-Palestinian" mindset, Turkish solidarity with the Palestinians is less related to the Palestinian cause and more to the Islamists' devotion to the dream of "conquest."